HOW CAN YOU AVOID WHAT YOU CAN’T SEE? A dynamic, real-time collision detection system to enhance the safety of stockpile operations. Avoid costly damage to infrastructure, through collision, reduce downtime and effectively manage stockpiled material. By employing smart & dynamic geo-reference boundaries around both mobile plant, fixed infrastructure or hazardous areas, collisions can be detected. SNS SiTRACK is an advanced collision detection system that can be used on any vehicle such as dozers, conveyers, stackers and reclaimers – anything that is used for stockpile management. Integrated software come pre-loaded on a Trimble 12.1″ rugged android tablet that provides 4 levels of collision detection. Combined with two advanced 220 channel Trimble GNSS receivers supporting multiple constellations including Beidou and QZSS for performance positioning around infrastructure. In addition the GNSS receivers also leverage Trimble Proprietry xFill RTK augmentation. Applications of SNS SiTRACK include manned, semi-autonomous, autonomous or remote control machines. SNS SiTRACK is fully compatible with any wireless system onsite, or SITECH WA can design and install a Rajant Wireless mesh system for the fastest data transfer rate available in the market. SNS SiTRACK can also operate in Cab without the need for a Wi-Fi system provided it can achieve high precision through a local GNSS correction signal. 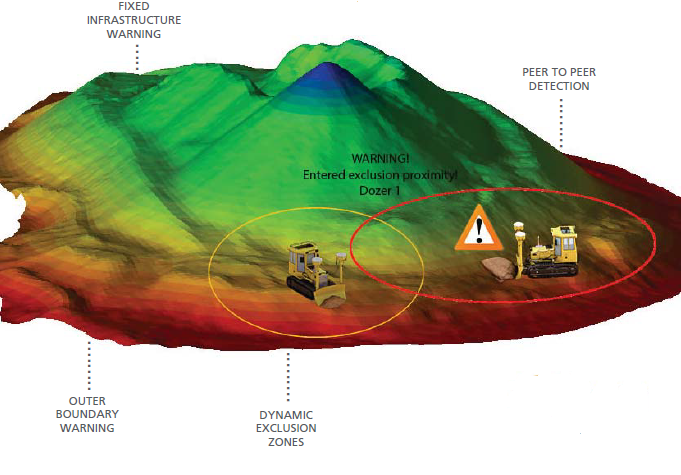 Proximity and breach zones provide visual and audible alerts and warnings for an operator, or mechanical warnings and shut-offs for remote controlled or autonomous vehicles. SNS SiTRACK provides the highest level of safety to prevent harm to operators and damage to key assets. The system is designed around the concept that each and every asset can monitor its own proximity detection and warnings simultaneously with every other asset in the system. In practice this means that the operator can provide each asset with its own Geofence conditions and the system will monitor any intrusions into not only that assets boundaries but also and adjacent boundaries in near real time.